You may as well ask why do people fall in love? The reasons are irrational, the motives are mixed and the original impulse is often discolored or betrayed. I started collecting paperweights when I was in my 20s. But like most of my collectibles I didn’t really focus on building a collection….it just happened. When asked, as we often are, what do you want for your birthday, Christmas etc. I would tell friends and family, well I do collect paperweights. I suppose that is why I have such an eclectic mix of glass paperweights. Over the last five months I have covered a fairly large range of subjects about collecting, collectors and the many collectibles that I have, in this blog. How to research collectibles and the joy of discovering the story behind your collectible. The stories about the makers and collectors of paperweights are rich and sometimes mysterious. That makes for an interesting and exciting hobby to collect these art objects. 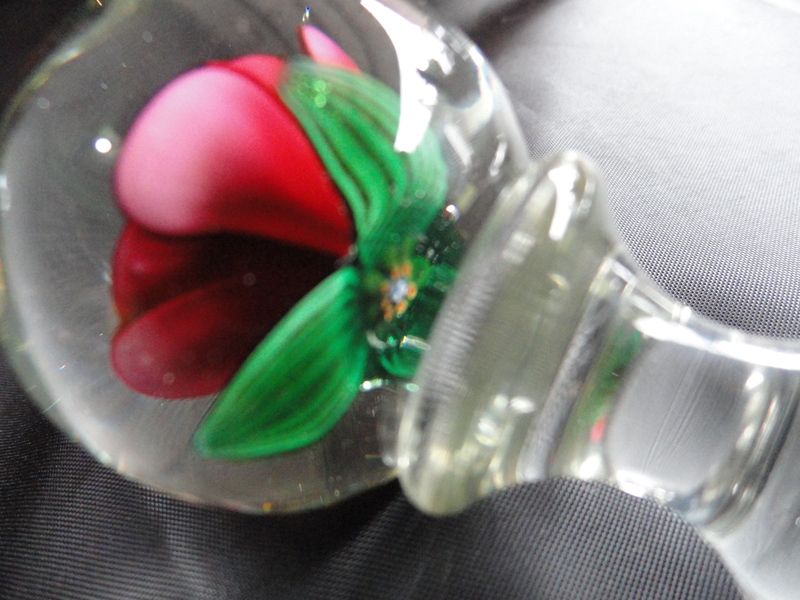 Over the next few weeks or months, (however long it takes me) I will try to tell you about paperweights, who makes them, who collects them and why. It should be fun so follow along and check back often as I buy, sell, trade and build my collection. Decorative glass paperweights fit easily into the hand and are actually meant to be handled and viewed from various directions through the dome, which acts like a lens to make the design change in its appearance with its movements in an attractive way. A magnifying glass is often used to gain appreciation of the fine detail of the work within. They have a flat or slightly concave base on which they stably rest, and a domed top, which may be faceted or cut. The glass is usually lead glass. The dome may be coated with one or more thin layers of colored glass, and have windows cut through it to reveal the interior motif. The exact shape or profile of the dome varies somewhat from one artist or factory to another, but in fine examples will be tuned to the subject within to show it off to best advantage. The base may be frosted, but is more often polished. They may also be cut in one of several variations. Star-cut bases have a multi-pointed star, while a diamond cut base has grooves cut in a criss-cross pattern. A footed weight has a flange in the base. The ground on which the inner parts rest may be clear or colored, made of unfused sand, or resemble lace (latticinio). Paperweights are made by sole artisans, and in factories where many artists and technicians collaborate. Both may produce inexpensive as well as “collector” weights. 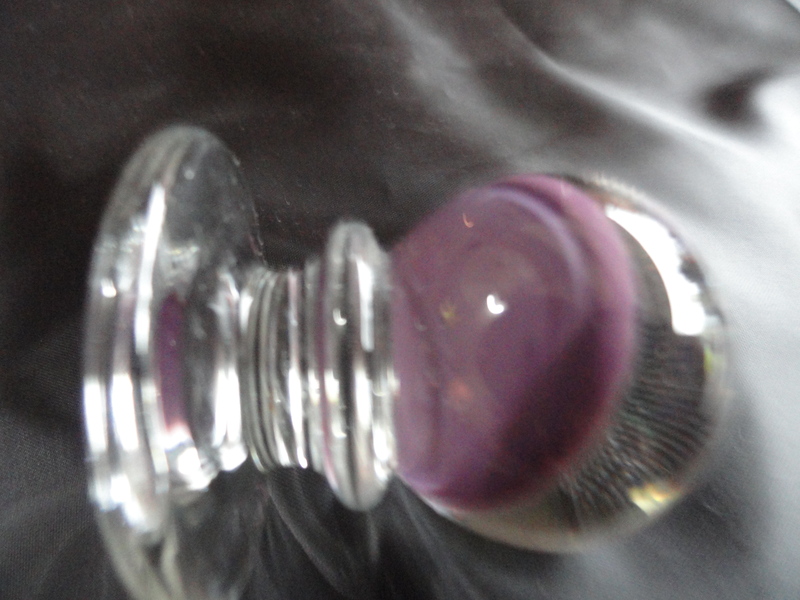 Workmanship, design, rarity, and condition determine the value of a paperweight. They range in price from a few dollars, to a record $258,500 once paid for an antique French weight. Antique weights, of which perhaps 10,000 or so survive (mostly in museums), generally appreciate steadily in value. Visible flaws, such as bubbles, striations and scratches affect the value. Glass should not have a yellow or greenish cast, and there should be no unintentional asymmetries, or unevenly spaced or broken elements. Generally, larger weights are more costly and desirable. In a modern piece, an identifying mark and date are imperative. Antique paperweights were made in the “classic” years between 1845 and 1860 primarily in three French factories named Baccarat, St. Louis, and Clichy. They made between fifteen and twenty five thousand weights in the classic period. Pantin, also a French glass company is known to a lessor degree but should be added as a great paperweight company of the period. Weights (mainly of lesser quality) were also made in the United States, Great Britain, and elsewhere, though Bacchus (UK) and New England Glass Company (USA) produced some that equaled the best of the French. Modern weights have been made from about 1950 to the present. In the U.S., Charles Kaziun started in 1940 to produce buttons, paperweights, inkwells and other bottles, using lamp-work of elegant simplicity. In Scotland, the pioneering work of Paul Ysart from the 1930s onward preceded a new generation of artists such as William Manson, Peter McDougall, Peter Holmes and John Deacons. A further impetus to reviving interest in paperweights was the publication of Evangiline Bergstrom’s book, Old Glass Paperweights, the first of a new genre. NOTE: I only put photos of items I own or have owned in my blog, so anytime you see a photo you know it is part of my collection. I don’t use anyone’s photos but my own. Charles Kaziun Jr. Miniature Pedestal paperweight, Spider Lily on Gold flecked background (one of his most popular peices) marked with his characteristic 14 karat gold “K” signature on the bottom side of the ball of the weight. Currently being sold on eBay for $435.00. Actual retail value listed in price guide is $1400.00. A number of small studios appeared in the middle 20th century, particularly in the US. These may have several to some dozens of workers with various levels of skill cooperating to produce their own distinctive “line”. Notable examples are Lundberg Studios, Orient and Flume, Correia Art Glass, Lotton, and Parabelle Glass. In later blogs I will talk about and show photos of my collection of all of these studios. In the late 1960s and 1970s, artists such as Paul Stankard, his former assistant, Jim D’Onofrio, Chris Buzzini, Delmo and daughter Debbie Tarsitano, Victor Trabucco and sons, Gordon Smith, Rick Ayotte and his daughter Melissa, and the father and son team of Bob and Ray Banford, began breaking new ground and were able to produce fine paperweights rivaling anything produced in the classic period. Collectors may specialize in one of several types of paperweights, but more often they wind up with an eclectic mix. Millefiori paperweights contain thin cross-sections of cylindrical composite canes made from colored rods and usually resemble little flowers, although they can be designed after anything, even letters and dates. These are usually made in a factory setting. The exist in many variations such as scattered, patterned, close concentric or carpet ground. Sometimes the canes are formed into a sort of upright tuft shaped like a mushroom that is incased in the dome. Lampwork paperweights have objects such as flowers, fruit, butterflies or animals constructed by shaping and working bits of colored glass with a gas burner or torch and assembling them into attractive compositions, which are then incorporated into the dome. This is a form particularly favored by studio artists. The objects are often stylized, but may be highly realistic. Sulfide paperweights have an encased cameo-like medallion or portrait plaque made from a special ceramic that is able to reproduce very fine detail. They often are produced to commemorate some person or event. Although still produced today their heyday was before the classic period. Swirl paperweights have opaque rods of two or three colors radiating like a pinwheel from a central millefiori floret. A similar style, the marbrie, is a millefiori containing weight that has several bands of color close to the surface that descend from the apex in a looping pattern to the bottom of the weight. Another variation is the Crown weight. It has twisted ribbons, alternately colored and lacy white, which radiate from the crown from a central millefiori floret down to converge again at the base. This was first devised in the Saint Louis factory and remains popular today. Miniature weights have a diameter of less than two inches or so, and magnums have a diameter greater than about 3.25 inches. 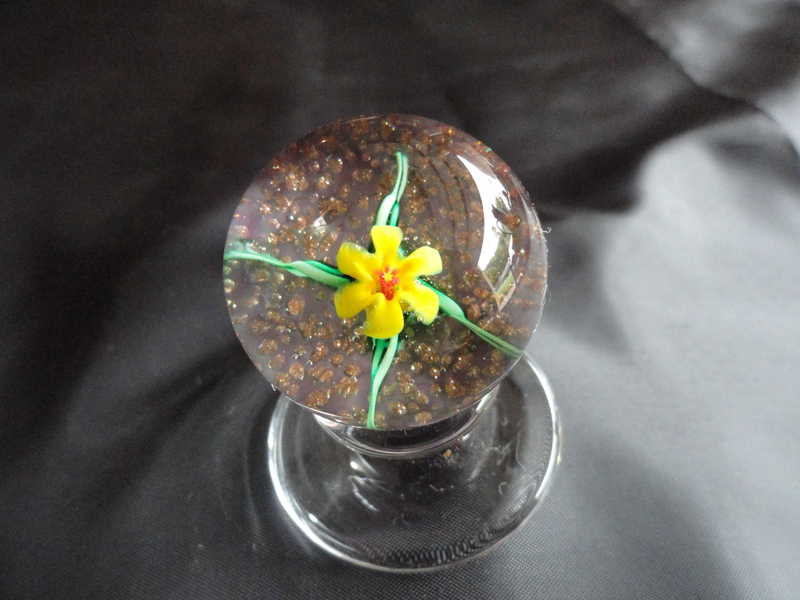 California-style paperweights are made by “painting” the surface of the dome with colored molten glass (torchwork), and manipulated with picks or other tools. They may also be sprayed while hot with various metallic salts to achieve an iridescent look. Victorian portrait and advertising paperweights were dome glass paperweights first made in Pittsburgh, Pennsylvania using a process patented in 1882 by William H. Maxwell. The portrait paperweights contained pictures of ordinary people reproduced on a milk glass disk and encased within clear glass. This same process was also used to produce paperweights with the owner’s name encased or an advertisement of a business or product. Pittsburgher Albert A. Graeser, patented a different process for making advertising paperweights in 1892. The Graeser process involved sealing an image to the underside of a rectangular glass blank using a milkglass or enamellike glaze. Many paperweights of the late 1800s are marked either J. N. Abrams or Barnes and Abrams and may list either the 1882 Maxwell or 1892 Graeser patent date. It has been theorized that Barnes and Abrams did not actually manufacture advertising paperweights for their customers, but instead subcontracted the actual manufacturing task out to Pittsburgh area glasshouses. The Paperweight Collectors Association Annual Bulletins published for 2000, 2001 and 2002 describe these in detail. Bohemian paperweights were particularly popular in Victorian times. 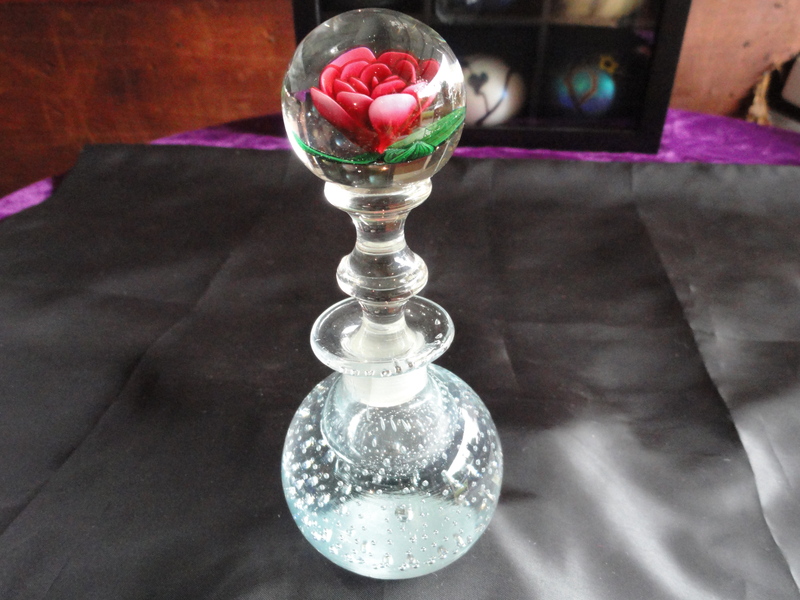 Large engraved or cut hollow spheres of ruby glass were a common form. Notable displays of paperweight collections can be seen in a number of museums. The Wheaton Village museum in Millville, NJ has many examples of American paperweights. The Bergstrom-Mahler museum in Neenah, Wisconsin contains a particularly fine collection of representative paperweights. The Corning Museum of Glass in Corning, NY also has an exceptional collection of fine paperweights. There are many paperweight collectors worldwide. Several collectors associations hold national or regional conventions, and sponsor activities such as tours, lectures, and auctions. Famous collectors include such literary figures as Collete, Oscar Wilde and Truman Capote. Princess Eugenie, Napoleon III’s wife, the wife of Mexico’s Emporer Maximillion and King Farouk were also avid collectors. Paperweights just have to be the most interesting items I collect. You can see most of my collection being sold on eBay by putting your cursor on My Assistant “the duck” and press enter to go to my eBay store, Kelekchens. So…follow along with me as I describe my collection and the stories behind it all. Until next time Happy Collecting and remember “the best is yet to come”.